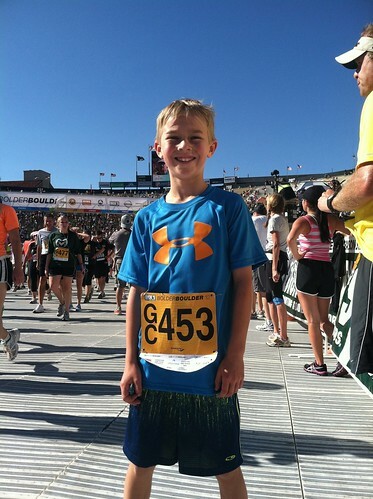 2012 BolderBoulder 10K – Running again! – What is new in Twizzler-land? After two years of walking the Bolder Boulder (2010 and 2011) with Tobey and my Pops, it was time to run again. Tobey has been steadily improving his running pace this spring, setting new personal bests for the mile (8:33) and a 5K (26:10) in the month preceding the Bolder Boulder. So, going into the weeks before the event, we had agreed to at the very least alternate running and walking miles over the course of the 6.2 miles. I like to think this has worked out fairly well so far in 2012. Tobey is an absolute joy to run with already at the age of 9. He totally gets pacing himself, and he already has a fairly effortless stride and technique. I still love to run at the age of 43, and I hope I’ve set him up to do the same – whether he decides to compete a bit in the future (i.e. joining the High School Cross Country team) or just run fun events like the Bolder Boulder or Fans on the Field for fun or to stay in shape… it’s up to him. As for that sub 60 minute 10K – watch out next year, Bolder Boulder! 3 Responses to "2012 BolderBoulder 10K – Running again!" We are all very proud of both of you! Tobey, your toughness was evidenced by your run, so now you do not need the tough pose! LOL Alan, 30 yrs later passing it on, how great is that?! It is truly great to pass a love for running on to the next generation!